The Golden State has plenty of golden opportunities. Reach out to local Realtors in powerful markets like San Francisco and Long Beach, CA. Email leads easily once you have this California Realtor email list, which is full of human-verified, quality contact data. Do you really need to connect with local Realtors? Build powerful B2B relationships with the most influential people in one of the most important housing markets in the U.S. Our California real estate agent email database pulls a huge amount of already organized and verified emails and contact information, so you can get started with communicating with this powerful group right away. From real estate agents' emails to phone numbers to offices addresses to even fax numbers, this directory contains everything you'd need to make a great impression on these important local professionals, who talk to Californian business- and home-buyers every day. This is one of Bookyourdata.com's many ready-made products, meaning that it's been pulled and verified already and you can download it right away. 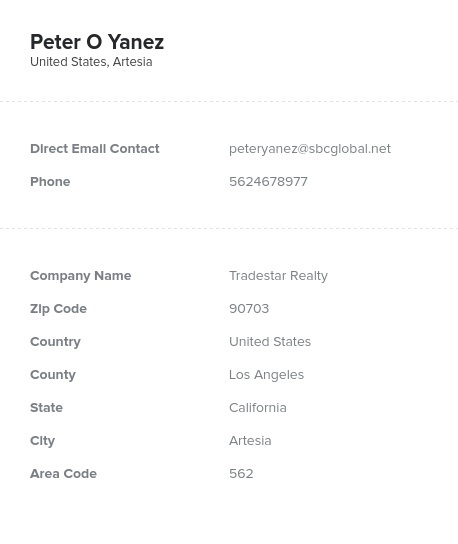 Buy this mailing list of real estate brokers in California if you want to find local connections up and down the state, from Sacramento all the way to San Diego, from Fresno to Ocean City. Note that you can also further customize by using our list-builder tool to find Californian real estate agents by ZIP code. Narrow your search to areas surrounding Los Angeles, CA, for instance, like Anaheim, San Bernardino, or Pasadena. Buy this pre-made Californian real estate agent list or create your own today!